Dissolves dirt, grease, grit, brake dust, and road grime! Aquapel Glass Windshield Cleaner is an advanced, non-streaking glass cleaner that removes the dirt but leaves the glass protectant in place. Aquapel Glass Windshield Cleaner is compatible with all automotive brand urethane sealants! The heavy duty foam glass cleaner eliminates dirt and grease and leaves no film behind. Your vehicle's glass will be clean and still protected after using Aquapel Glass Windshield Cleaner. Aquapel Glass Windshield Cleaner is a thick foam that clings to vertical surfaces. It stays put to dissolve grease, dirt, grit, brake dust and road grime. Does your glass cleaner do that? Aquapel Glass Windshield Cleaner leaves no film or streaks behind. Your auto glass and windshield will be totally clean. Aquapel Glass Windshield Cleaner contains no ammonia or ozone-depleting chemicals. 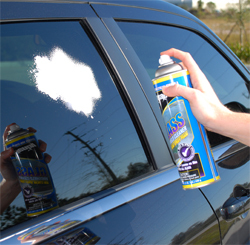 Ammonia is a powerful cleaner that destroys window tint. 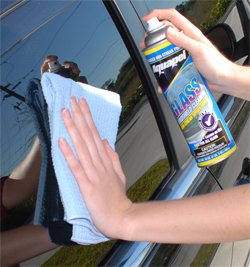 Aquapel Glass Windshield Cleaner is safe to use on tinted glass. Aquapel Glass Windshield Cleaner is a professional quality product. It is made by PPG Industries, a leader in automotive glass. Use Aquapel Glass Windshield Cleaner to clean windshields treated with Aquapel Glass Treatment. This glass cleaner will not remove the glass treatment so your auto glass stays protected. For the best results, wipe off Aquapel Glass Windshield Cleaner with a Cobra Microfiber Waffle Weave Glass Towel. This highly absorbent, extra gentle towel catches dirt and oils in its weave to thoroughly clean auto glass without leaving streaks. Enjoy clean, streak-free auto glass with Aquapel Glass Windshield Cleaner. This heavy duty foaming glass cleaner dissolves dirt and grime and leaves the glass clear, clean, and still protected.